Ksenija Lubarda is Director of Sales & Marketing department in Radisson Blu Old Mill Hotel in Belgrade. She is well known for her remarkable career in hospitality industry – with more than 13 years of sales and leadership experience. Prior to Radisson Blu Old Mill Hotel, Belgrade she held role of progressive leadership in hotel Hyatt Regency Belgrade, most recently serving as Sales Manager supporting the company’s active commitment to operational excellence. 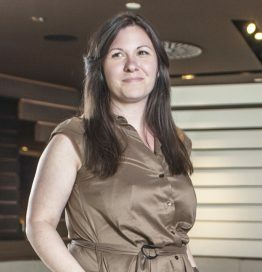 She joined Carlson Rezidor Hotel Group in February 2014 as the first employee in development stage of Radisson Blu Old Mill Hotel, Belgrade, where she played a key role in establishing the new hotel on the market. As director, Ksenija oversees overall coordination, functional management and leadership of sales and marketing initiatives for Radisson Blu Old Mill Hotel, Belgrade. Key functions include development and execution of sales strategies and developing marketing initiatives and new customer opportunities. She graduated in 2006 from European University, Faculty of International Management – Belgrade and in 2011 received a Ph.D. in International Management.